"Laurel Corona brings Homer's epic to life in this spectacular novel of the ancient world. Populated with a rich cast of characters—from Helen of Troy to Odysseus—this is a novel you won't want to put down." "A beautiful excursion into the realms of The Odyssey, with some surprises Homer didn't know about." Over dinner one evening, after The Four Seasons was well on its way to publication, my partner and I started throwing around possibilities for the setting of my second novel. "How about Greece?" he said. "I’ve always wanted to go to Greece." My partner has been a great lover of Homer since he was young. "What about the Odyssey?" I asked, though I wasn’t enthusiastic about the idea at all. Most of what I remembered about Homer’s epics centered around bloodshed and fantasy, neither of which I have any interest in writing about. There was always Penelope, but I recalled not liking her much because she seemed to do nothing but cry, sleep, and ruin her weaving. All of my novels have female characters at the center, and the Penelope I remembered definitely wasn’t a heroine I would get along with very well as I wrote. Then it came to me: what if, when Odysseus went off to the Trojan War, Penelope was pregnant with a daughter? Maybe that daughter could be the heroine. Almost immediately the Odyssey opened up in an entirely new way. I saw how the story might be told if the author were a woman. I envisioned it as a tale not about those who go off to war, but about those who stay behind. And I liked it better that way. This novel is about girls having to grow up quickly in difficult environments. It’s about women gaining the skills needed to lead, negotiating the world of powerful men, and finding a way to thrive wherever they are. 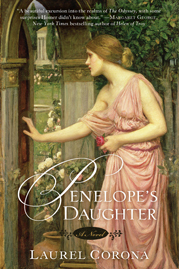 Penelope’s Daughter honors the real women of the Odyssey. If there is truth to the tale, they must have been half the population, even if they don’t show up in the story Homer wrote down. Whereas Homer focuses on women mostly as threats and troublemakers, Penelope’s Daughter revels in the full range of things they are—mothers, daughters, slaves, weavers, high priestesses, queens. I came to see my story not as fiction at all, but as voices that are finally being heard. I hope you will enjoy what they have to say. © Copyright 2008-2013, Laurel Corona. All Rights Reserved.